If you are looking for a dealership you can trust in St. John’s, Newfoundland for the service and maintenance of your Audi vehicle, you have come to the right place at Bill Matthews Audi. At Bill Matthews Audi, we are the only dealership with trained and certified Audi technicians, and we know your vehicle inside and out. We will keep it running in perfect condition and make sure it retains its resale value and reliability. At Bill Matthews Audi, our team of certified technicians have years of experience working with Audi products, and they are truly passionate about the work that they do. They will have your Audi vehicle back in perfect condition in no time, and they have the expertise and the modern equipment to preserve its performance, reliability, and efficiency. 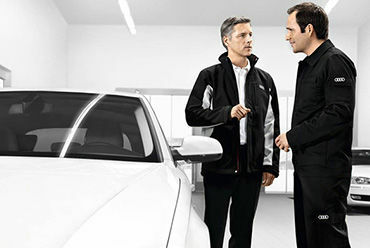 When it comes to Audi service and maintenance in Newfoundland, you can trust the experts at Bill Matthews Audi. They know your Audi inside and out. We pride ourselves on our level of customer service at Bill Matthews Audi, and you will always be treated with respect, honesty, and dedication when you come and visit us. To learn more about our service and maintenance products for your Audi, or to book your appointment, contact us today!